A Salford social enterprise has today been announced as a winner in the Living Wage Champion Awards 2018 – and now aims to drive the city to become the country’s first fully Living Wage health and social care system by 2021. 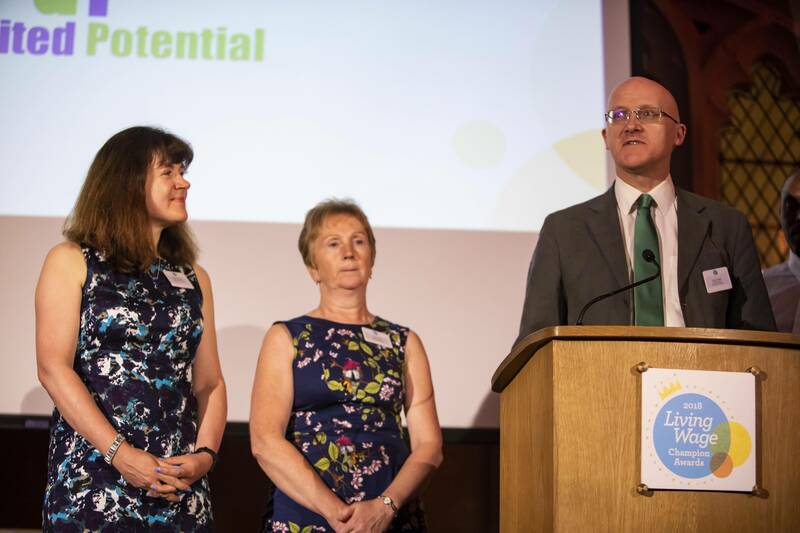 Unlimited Potential, whose work supports people to lead happier and healthier lives, won the Industry Leadership award thanks to its dedication to promoting the real Living Wage through Salford’s Health and Wellbeing Board. Through Unlimited Potential’s leadership, the Board agreed to establish a multi-sectoral Living Wage task group, chaired by Unlimited Potential’s chief executive, Chris Dabbs. It has so far successfully supported the accreditation of 11 major Salford health and care organisations as Living Wage employers. Chris said: “We’re delighted that once again the city of Salford is being recognised for its commitment to the real Living Wage. The accreditation of the 11 organisations is just another step to our city becoming the country’s first fully Living Wage health and social care system by 2021. The awards, which were sponsored by Aviva, KPMG and the City of London Corporation, saw two other winners of the Industry Leadership Award, including Penrose Care and The Haven Wolverhampton. 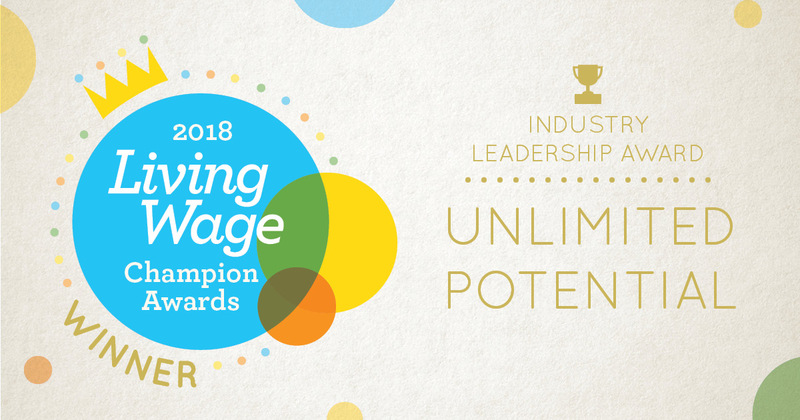 Tess Lanning, director of the Living Wage Foundation, said: “Congratulations to Unlimited Potential on becoming a Living Wage Champion award winner. It’s an organisation that does vital work every day, but by paying the real Living Wage, and promoting its wider take-up, it is also leading the way in placing dignity and respect at the heart of its organisation and the wider system in which it works. The real Living Wage is an hourly pay rate set independently, updated annually, and calculated according to the basic cost of living. Employers choose to pay the real Living Wage on a voluntary basis. The awards were judged by an independent panel of business and community leaders. The real Living Wage is the only rate calculated according to what people need to make ends meet. It provides a voluntary benchmark for employers that choose to take a stand by ensuring their staff earn a wage that meets the costs and pressures they face in their everyday lives. The UK Living Wage is currently £8.75 per hour. There is a separate London Living Wage rate of £10.20 per hour to reflect the higher costs of transport, childcare and housing in the capital. These figures are calculated annually by the Resolution Foundation and overseen by the Living Wage Commission, based on the best available evidence on living standards in London and the UK. The Living Wage Foundation is the organisation at the heart of the movement of businesses, organisations and individuals who campaign for the simple idea that a hard day’s work deserves a fair day’s pay. We recognise and celebrate the leadership shown by responsible employers who voluntarily choose to go further and pay a real Living Wage based on the cost of living, not just the government minimum. There are currently over 4,200 accredited employers. What’s the difference between the real Living Wage and the Government’s national living wage? In April 2016 the government introduced a higher minimum wage rate for all staff over 25 years of age inspired by the Living Wage campaign – even calling it the ‘national living wage’. However, the government’s ‘national living wage’ is not calculated according to what employees and their families need to live. Instead, it is based on a target to reach 60% of median earnings by 2020. Under current forecasts this means a rise to less than £9 per hour by 2020. For under 25s, the minimum wage rates also take into account affordability for employers. The real Living Wage rates are higher because they are independently-calculated based on what people need to get by. That’s why the Living Wage Foundation encourages all employers that can afford to do so to ensure their employees earn a wage that meets the costs of living, not just the government minimum. Unlimited Potential is a social enterprise that is based in Salford, Greater Manchester. It specialises in social innovation for happiness and health, by working together with local people and communities to create new solutions to social and economic challenges.